Kyōto, "Capital of 1000 Years". The Heian period was preceded by the Nara period and began in 794 A.D. after the movement of the capital of Japan to Heian-kyō (present-day Kyōto), by the 50th emperor, Emperor Kanmu. Kanmu first tried to move the capital to Nagaoka-kyō, but a series of disasters befell the city, prompting the emperor to relocate the capital a second time, to Heian. The Heian Period is considered a high point in Japanese culture that later generations have always admired. The period is also noted for the rise of the samurai class, which would eventually take power and start the feudal period of Japan. Nominally, sovereignty lay in the emperor but in fact power was wielded by the Fujiwara nobility. However, to protect their interests in the provinces, the Fujiwara and other noble families required guards, police and soldiers. The warrior class made steady political gains throughout the Heian period. As early as 939 A.D., Taira no Masakado threatened the authority of the central government, leading an uprising in the eastern province of Hitachi, and almost simultaneously, Fujiwara no Sumitomo rebelled in the west. Still, a true military takeover of the Japanese government was centuries away, when much of the strength of the government would lie within the private armies of the shogunate. The entry of the warrior class into court influence was a result of the Hōgen Rebellion. At this time Taira no Kiyomori revived the Fujiwara practices by placing his grandson on the throne to rule Japan by regency. Their clan, the Taira, would not be overthrown until after the Genpei War, which marked the start of the shogunate. The Kamakura period began in 1185 when Minamoto no Yoritomo seized power from the emperors and established the shogunate in Kamakura. When Emperor Kanmu moved the capital to Heian-kyō (Kyōto), which remained the imperial capital for the next 1,000 years, he did so not only to strengthen imperial authority but also to improve his seat of government geopolitically. Nara was abandoned after only 70 years in part due to the ascendancy of Dōkyō and the encroaching secular power of the Buddhist institutions there. Kyōto had good river access to the sea and could be reached by land routes from the eastern provinces. The early Heian period (784–967) continued Nara culture; the Heian capital was patterned on the Chinese Tang capital at Chang'an, as was Nara, but on a larger scale than Nara. Kanmu endeavoured to improve the Tang-style administrative system which was in use. Known as the ritsuryō, this system attempted to recreate the Tang imperium in Japan, despite the "tremendous differences in the levels of development between the two countries". Despite the decline of the Taika–Taihō reforms, imperial government was vigorous during the early Heian period. Kanmu's avoidance of drastic reform decreased the intensity of political struggles, and he became recognized as one of Japan's most forceful emperors. Although Kanmu had abandoned universal conscription in 792, he still waged major military offensives to subjugate the Emishi, possible descendants of the displaced Jōmon, living in northern and eastern Japan. After making temporary gains in 794, in 797, Kanmu appointed a new commander, Sakanoue no Tamuramaro, under the title Sei-i Taishōgun ("Barbarian-subduing generalissimo"). By 801, the shogun had defeated the Emishi and had extended the imperial domains to the eastern end of Honshū. Imperial control over the provinces was tenuous at best, however. In the ninth and tenth centuries, much authority was lost to the great families, who disregarded the Chinese-style land and tax systems imposed by the government in Kyoto. Stability came to Japan, but, even though succession was ensured for the imperial family through heredity, power again concentrated in the hands of one noble family, the Fujiwara which also helped Japan develop more. As the Soga clan had taken control of the throne in the sixth century, the Fujiwara by the ninth century had intermarried with the imperial family, and one of their members was the first head of the Emperor's Private Office. 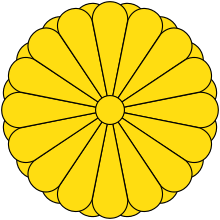 Another Fujiwara became regent, Sesshō for his grandson, then a minor emperor, and yet another was appointed Kampaku. Toward the end of the ninth century, several emperors tried, but failed, to check the Fujiwara. For a time, however, during the reign of Emperor Daigo (897–930), the Fujiwara regency was suspended as he ruled directly. Despite their usurpation of imperial authority, the Fujiwara presided over a period of cultural and artistic flowering at the imperial court and among the aristocracy. There was great interest in graceful poetry and vernacular literature. Two types of phonetic Japanese script: katakana, a simplified script that was developed by using parts of Chinese characters, was abbreviated to hiragana, a cursive syllabary with a distinct writing method that was uniquely Japanese. Hiragana gave written expression to the spoken word and, with it, to the rise in Japan's famous vernacular literature, much of it written by court women who had not been trained in Chinese as had their male counterparts. Three late tenth century and early eleventh century women presented their views of life and romance at the Heian court in Kagerō Nikki by "the mother of Fujiwara Michitsuna", The Pillow Book by Sei Shōnagon and The Tale of Genji by Murasaki Shikibu. Indigenous art also flourished under the Fujiwara after centuries of imitating Chinese forms. Vividly colored yamato-e, Japanese style paintings of court life and stories about temples and shrines became common in the mid-to-late Heian period, setting patterns for Japanese art to this day. As culture flourished, so did decentralization. Whereas the first phase of shōen development in the early Heian period had seen the opening of new lands and the granting of the use of lands to aristocrats and religious institutions, the second phase saw the growth of patrimonial "house governments", as in the old clan system. (In fact, the form of the old clan system had remained largely intact within the great old centralized government.) New institutions were now needed in the face of social, economic, and political changes. The Taihō Code lapsed, its institutions relegated to ceremonial functions. Family administrations now became public institutions. As the most powerful family, the Fujiwara governed Japan and determined the general affairs of state, such as succession to the throne. Family and state affairs were thoroughly intermixed, a pattern followed among other families, monasteries, and even the imperial family. Land management became the primary occupation of the aristocracy, not so much because direct control by the imperial family or central government had declined but more from strong family solidarity and a lack of a sense of Japan as a single nation. Under the early courts, when military conscription had been centrally controlled, military affairs had been taken out of the hands of the provincial aristocracy. But as the system broke down after 792, local power holders again became the primary source of military strength. The re-establishment of an efficient military system was made gradually through a process of trial-and-error. At that time the imperial court did not possess an army but rather relied on an organization of professional warriors composed mainly of oryoshi, which were appointed to an individual province and tsuibushi, which were appointed over imperial circuits or for specific tasks. This gave rise to the Japanese military class. Nonetheless final authority rested with the imperial court. Shōen holders had access to manpower and, as they obtained improved military technology (such as new training methods, more powerful bows, armor, horses, and superior swords) and faced worsening local conditions in the ninth century, military service became part of shōen life. Not only the shōen but also civil and religious institutions formed private guard units to protect themselves. Gradually, the provincial upper class was transformed into a new military elite based on the ideals of the bushi ("warrior") or samurai ("one who serves"). The Fujiwara controlled the throne until the reign of Emperor Go-Sanjō (1068–1073), the first emperor not born of a Fujiwara mother since the ninth century. Go-Sanjo, determined to restore imperial control through strong personal rule, implemented reforms to curb Fujiwara influence. He also established an office to compile and validate estate records with the aim of reasserting central control. Many shōen were not properly certified, and large landholders, like the Fujiwara, felt threatened with the loss of their lands. Go-Sanjo also established the In-no-chō (院庁 "Office of the Cloistered Emperor"), which was held by a succession of emperors who abdicated to devote themselves to behind-the-scenes governance, or insei. The Taira were seduced by court life and ignored problems in the provinces , where the Minamoto Clan were rebuilding their strength. In 1183, two years after Kiyomori's death, Yoritomo Minamoto dispatched his brothers Yoshitsune and Noriyori to attack Kyoto. The Taira were routed and forced to flee, and the Empress Dowager tried to drown herself and the 7-year old Emperor (he perished, but his mother survived). Takakura's other son succeeded as Emperor Go-Toba. With Yoritomo firmly established, the bakufu system that would govern Japan for the next seven centuries was in place. He appointed military governors, or daimyos, to rule over the provinces, and stewards, or jito to supervise public and private estates. 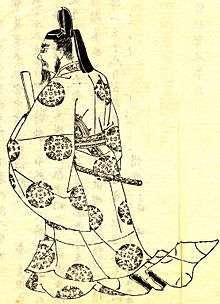 Yoritomo then turned his attention to the elimination of the powerful Fujiwara family, which sheltered his rebellious brother Yoshitsune. Three years later, he was appointed shogun in Kyoto. One year before his death in 1199, Yoritomo expelled the teenage emperor Go-Toba from the throne. Two of Go-Toba's sons succeeded him, but they would also be removed by Yoritomo's successors to the shogunate. 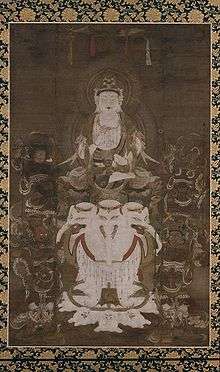 Bodhisattva Fugen Enmei, 12th century painting on silk, late Heian period. Buddhism began to spread throughout Japan during the Heian period, primarily through two major esoteric sects, Tendai and Shingon. Tendai originated in China and is based on the Lotus Sutra, one of the most important sutras of Mahayana Buddhism; Saichō was key to its transmission to Japan. Shingon is the Japanese transmission of the Chinese Chen Yen school. 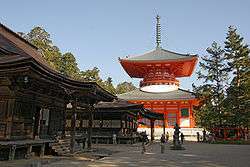 Shingon, brought to Japan by the monk Kūkai, emphasizes Esoteric Buddhism. Both Kūkai and Saichō aimed to connect state and religion and establish support from the aristocracy, leading to the notion of 'aristocratic Buddhism'. An important element of Tendai doctrine was the suggestion that enlightenment was accessible to "every creature". Saichō also sought independent ordination for Tendai monks. A close relationship developed between the Tendai monastery complex on Mount Hiei and the imperial court in its new capital at the foot of the mountain. As a result, Tendai emphasized great reverence for the emperor and the nation. Kanmu himself was a notable patron of the otherworldly Tendai sect, which rose to great power over the ensuing centuries. Kūkai greatly impressed the emperors who succeeded Kanmu, and also generations of Japanese, not only with his holiness but also with his poetry, calligraphy, painting, and sculpture. 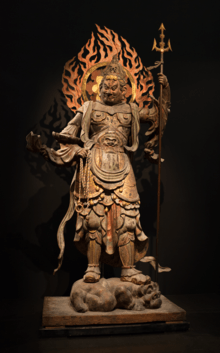 Shingon, through its use of "rich symbols, rituals and mandalas" held a wide-ranging appeal. Poetry, in particular, was a staple of court life. Nobles and ladies-in-waiting were expected to be well versed in the art of writing poetry as a mark of their status. Every occasion could call for the writing of a verse, from the birth of a child to the coronation of an emperor, or even a pretty scene of nature. A well-written poem or haiku could easily make or break one's reputation, and often was a key part of social interaction.Almost as important was the choice of calligraphy, or handwriting, used. The Japanese of this period believed handwriting could reflect the condition of a person's soul: therefore, poor or hasty writing could be considered a sign of poor breeding. Whether the script was Chinese or Japanese, good writing and artistic skill was paramount to social reputation when it came to poetry. Sei Shōnagon mentions in her Pillow Book that when a certain courtier tried to ask her advice about how to write a poem to the empress Sadako, she had to politely rebuke him because his writing was so poor. The Japanese Names of Medical Herbs (本草和名 Honzō Wamyō), written in 918 was also written in this period and more can be seen under Kampo. During the Heian period, beauty was widely considered an important part of what made one a "good" person. In cosmetic terms, aristocratic men and women powdered their faces and blackened their teeth, the latter termed ohaguro. The male courtly ideal included a faint moustache and thin goatee, while women's mouths were painted small and red, and their eyebrows were plucked or shaved and redrawn higher on the forehead (hikimayu). Women cultivated shiny, black flowing hair and a courtly woman's formal dress included a complex "twelve-layered robe" called jūnihitoe, though the actual number of layers varied. Costumes were determined by office and season, with a women's robes in particular following a system of color combinations representing flowers, plants, and animals specific to a season or month, (see the Japanese Wikipedia entries irome and kasane-no-irome). While on one hand the Heian period was an unusually long period of peace, it can also be argued that the period weakened Japan economically and led to poverty for all but a tiny few of its inhabitants. The control of rice fields provided a key source of income for families such as the Fujiwara and were a fundamental base for their power. The aristocratic beneficiaries of Heian culture, the Ryōmin (良民 "Good People") numbered about five thousand in a land of perhaps five million. One reason the samurai were able to take power was that the ruling nobility proved incompetent at managing Japan and its provinces. By the year 1000 the government no longer knew how to issue currency and money was gradually disappearing. Instead of a fully realised system of money circulation, rice was the primary unit of exchange. The lack of a solid medium of economic exchange is implicitly illustrated in novels of the time. For instance, messengers were rewarded with useful objects, e.g., an old silk kimono, rather than paid a fee. The game Total War: Shogun 2 has the Rise of the Samurai expansion pack as downloadable campaign. It allows the player to make their own version of the Genpei War which happened during the Heian period. 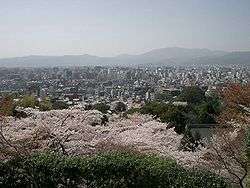 The player is able to choose one of the most powerful families of Japan at the time, the Taira, Minamoto or Fujiwara; each family fielding two branches for a total of six playable clans. The expansion pack features a different set of land units, ships and buildings and is also playable in the multiplayer modes. Cosmology of Kyoto is a Japanese video game set in 10th-11th century Japan. It is a point-and-click adventure game depicting Heian-kyo, including the religious beliefs, folklore and ghost tales of the time. It was praised by film critic Roger Ebert. ↑ Shively and McCullough 1999. ↑ Takei, Jiro; Keane, Marc P. SAKUTEIKI. Boston: Tuttle Publishing. p. 10. ISBN 978-0-8048-3294-6. ↑ Meyer, Milton W., Japan: A Concise History, page 44. ↑ Karl Friday, "Teeth and Claws, Provincial Warriors and the Heian Court" Monumenta Nipponica (Summer 1988): 155–170. ↑ Kitagawa 1966 p. 65. ↑ Morris (1964) p. xiv. ↑ "Heian Period." We-pedia. We-pedia, n.d. Web. 17 Feb. 2016. <http://www.wa-pedia.com/history/heian_period_era.shtml>. 1 2 Morris 1964 p.73. 1 2 Collins 1997 p.851. ↑ Britannica Kokusai Dai-Hyakkajiten article "Fujiwara no Yorimichi". ↑ Fallingstar, Cerridwen. White as Bone, Red as Blood: The Fox Sorceress. Cauldron Publications, 2009. ↑ Fallingstar, Cerridwen. White as Bone, Red as Blood: The Storm God. Cauldron Publications, 2011.